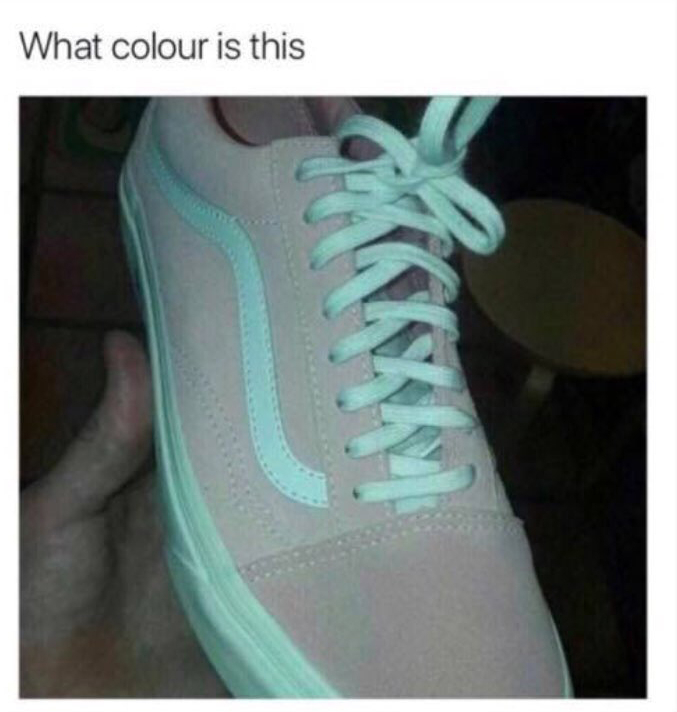 What Color Are These Shoes: Teal and Gray or Pink and White? It’s been two and a half years since #TheDress debate, and now the internet is divided over another item of clothing: a pair of Vans sneakers. Some people see gray shoes with teal laces and accents, while others see pink with white laces and accents. The Twitter user who first posted the viral photo indicated that they were not her shoes, but explained that she saw gray and teal. Many took her side, while others argued the opposite. Believe it or not, the sneakers are actually pink and white — or “mahogany rose” and “true white,” as they are described on the official Vans website. They sell for $60 and are available in 19 different colors, none of which are gray and teal. As you may remember, this has happened before. #TheDress made headlines in late February 2015 when people nearly lost their minds while trying to determine the colors of a lace dress. Some saw black and blue, while others saw white and gold. Ultimately, more than 4.4 million tweets about the dress were posted within a 24-hour period, according to Twitter data provided to BuzzFeed.